Three thousand miles. That’s how long it took before Luna and I dialed in a food routine that really worked on long-distance hikes. Nutrition is one of the biggest challenges any dog parent faces on the trail and it can be daunting. I want a healthy and happy hike for you and your pup, so here’s some intel. Luna’s a picky eater which doesn’t help. She also turns the woods into her own personal obstacle course while we tackle anywhere between 20 and 30 miles per day with little recovery. So yeah, it took me a little while to figure out a routine that was somewhat cost effective, accessible and most importantly, dense in nutrients that helped build and sustain Luna’s endurance deep into a thru-hike. I’ve found that high calorie, high carbohydrate burning foods provide great quick energy during activity. During longer distances or through more demanding terrain, like the mountains in the Northeast, our bodies burn more calories. Once the remaining fat from our bodies (both human and dog) has been used as reserves and trimmed off, the quick calories no longer keep us full and energized. We just keep burning through more and more. In short, this is why the focus needs to be on the dense, high-fat/high-protein foods. These act as longer-lasting energy and promote healthy muscle recovery. Whether its the Appalachian Trail, Pacific Crest Trail, Long Trail, any trail.. the food routine is crucial. A dog on a long-distance hike typically will need double or triple their calorie intake back home, but is all relative to milage and terrain. If Luna eats on average 800-1000 calories per day back home to keep up with 2-4hours of activity per day, she’ll get anywhere from 1,500-1,800 on trail for 8-12hours of hiking, with 2,500+ on town days. Recognize tougher terrain; if you’re hunger spikes during days with lots of elevation gain, so will theirs. One fairly major adjustment that I made with Luna’s diet was, like sled pullers and working farm dogs, switching to one large meal in the evening. I’ve heard opposing opinions on this, but have found it to work great for her working breed mentality and lifestyle. She gets a small amount of kibble in the morning (but will sometimes refuse) and one main meal in the evening where she has the entire sleep to digest. She wakes up ready to go. One big consideration is that eating better means prepping and planning resupply boxes throughout any given hike. SOJOS DOG FOOD: Luna achieves higher milage off leash, which can be a heavy responsibility when it comes to her health. So her nutrition demands are high, and kibbles that are high in calories just don’t cut it for maintaining energy deep into the day. Since her working drive is strong, she’s not an enthusiastic eater, and will never overeat (no matter how hard I try). Discovering Sojos was a game changer. It’s simple: freeze-dried raw meat and vegetables. Using only premium ingredients and lean proteins, Sojos builds and maintains muscle on Luna’s lean figure, and eliminates unnecessary fillers. Protein, fat, fiber, that's it. Her pace late into the day is incredible, and her body strong and able to recover quickly. It’s amazingly efficient- weighs 1/4 that of kibble, and rehydrates to 5 times the dry amount. This means we’re able to carry LESS weight, while eating MORE! After carrying heavy loads of kibble while trying to uphold an ultralight philosophy, this was a welcome adjustment. The best part? She really loves it. I like to switch up the flavors to keep her enthusiasm and achieve a well-rounded diet. Our favorites are the Wild Boar Recipe because of it’s 38% lean protein, no GMOS/grains/fillers and high levels of fatty acids and the Complete Lamb Recipe because of it’s wholesome carbohydrates and nutrient-rich superfoods. I had reservations about the calorie content of Sojos because it’s significantly lower than the kibbles we were using (300/cup vs. 450/cup), but because of it’s dehydrated weight, I’m able to feed her more per meal. I’ve come to realize though, that the nutrient density of the Sojos is what makes it work so well. Luna’s able to really USE all that she’s consuming, so the lower calories aren't detrimental. During her longest thru-hike eating primarily Sojo’s (CDT, 2,700ish miles), while most people are losing steam late into the hike, Luna was strong and fast, able keep up and pace us at 25-30 miles everyday. At the midway point, she weighed in at 45lbs... exactly what she started at. I was so impressed with her performance and believe it's evidence how incredible this food is. The food rehydrates quickly with hot water, but the smells it gives off while soaking puts Luna into a patient drool while she waits for it to cool off. Since I don’t typically carry a stove on trail, I experimented with cold soaking the food. It worked great and was fully rehydrated after 2 hours in a jar, and she didn’t have to wait to eat when we wrapped up for the day. KIBBLE: I supplement Luna’s raw diet with about 25% kibble to add some extra calories and carbohydrates. Foods I think are most effective are ones low in gluten, and high in fats and protein. Brands I like are Dr. Tims, Orijen, Merrick and Taste of the Wild. I use the Active Dog Pursuit Formula from Dr. Tim’s because of it’s 450 calories per cup and high levels protein and fat. Dry kibble is heavy and most contain lots of fillers that dogs burn through rather quickly, but it’s important to have some effective ones on hand for the calories. Especially in dry sections of trail with long water carries, where I’ll typically switch her to 50%kibble/50%Sojos intake to save on water. I like to order food from Chewy.com because of their awesome customer service and quick shipping. Then I prepackage it prior to a hike, or (on longer treks) will take a day off midway and prepare boxes for the second half. TREATS: Like her human counterparts, Luna also needs calories and nutrients throughout the day. Since I’m constantly training and reinforcing good behaviors on the trail, it’s important to have rewards she’s excited about. The key though, is not to overfeed while on the move. I look for the best calorie/weight ratio treats that are high in protein and easy to digest. While walking, I like to use small, bite-sized treats that she can take more frequently as rewards for listening and behaving. 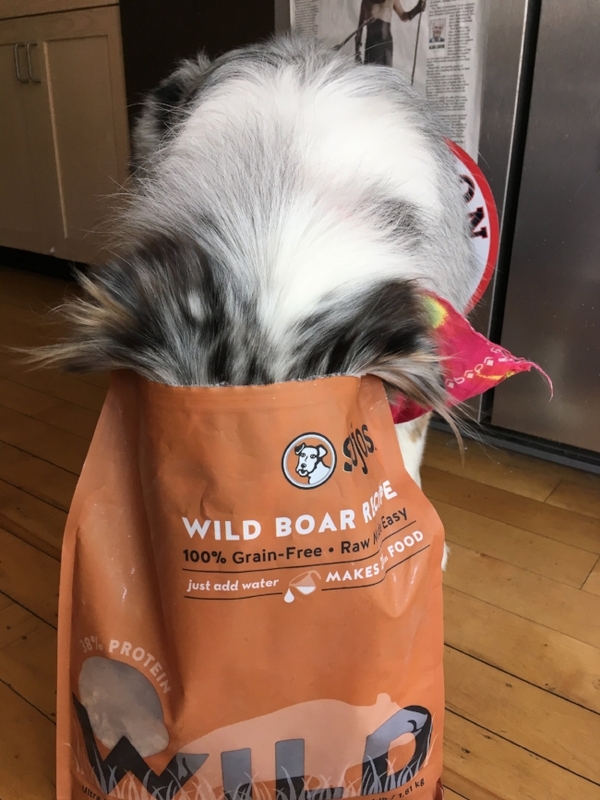 Some favorites: Sojos Turkey Toppers, Sojos Simply Freeze-Dried Treats (>50% protein and insanely light), Sojos Grain-Free Treats, Zuke’s Power Bones, and Blue Buffalo Wilderness Trail Treats and Pet Naturals Superfood Treats. Then during snack breaks, I’ll give her a bigger mouthful like Sojos Big Dog Bones, Blue Buffalo Wilderness Trail Biscuits or Newman’s Own Snack Sticks. Stay clear of jerky treats because they are tougher to digest on the move. In replacement of strong supplements, there are also plenty of treats with smaller amounts glucosamine for joint support. SUPPLEMENTS: Our lifestyle places high demands on Luna’s body. She’s constantly moving and adapting her body to various environments. Luna takes a Daily Probiotic to promote a healthy gut flora, support digestive comfort and immune system function, espeically since she frequently drinks out of streams and lakes as we hike. A large of her health regimen is focused on joint care, including cross-training with sprints, swimming, stretching and taking supplements for her joints. While on the trail, she takes a strong dose of Glycoflex Plus to help improve recovery time and manage joint inflammation. It makes a huge difference in her quickness, agility and recovery. I also like to keep Composure on hand to ease Luna's nerves during thunderstorms and other unforeseen stressful situations. OILS: I carry a 3oz bottle of olive oil and add a tbsp to her morning meal for added calories and fat. It also helps regulate digestion and maintains a healthy coat/skin. Like us human hikers, there is no real way to not end up in a caloric deficit during hiking days. It’s no different for our dogs. When we stop in towns, it’s the best opportunity to pile the calories on. I’ll typically let her free eat kibble and give her plenty of meat and eggs drizzled with olive oil. Yogurt and cottage cheese provide added fats and probiotics to help digest the larger portions. Luna is the greatest hiking partner I’ll ever have. It’s taken years, and many miles, to find the confidence in a routine that works…because I’ll never leave my dog behind. To all those other dog hiking duos.. I hope you find your rhythm too. *Disclaimer: I receive products from VetriScience and PetNaturals as a brand ambassador but that does not influence my opinions about the quality and effectiveness of their products.